The Theme Foundry started with a free WordPress theme, Vigilance, back in 2008. Since that day, we’ve focused mostly on premium WordPress themes. Today, we’re getting back to our roots. We’re incredibly excited to announce Make, a powerful new WordPress theme with unmatched versatility and style. 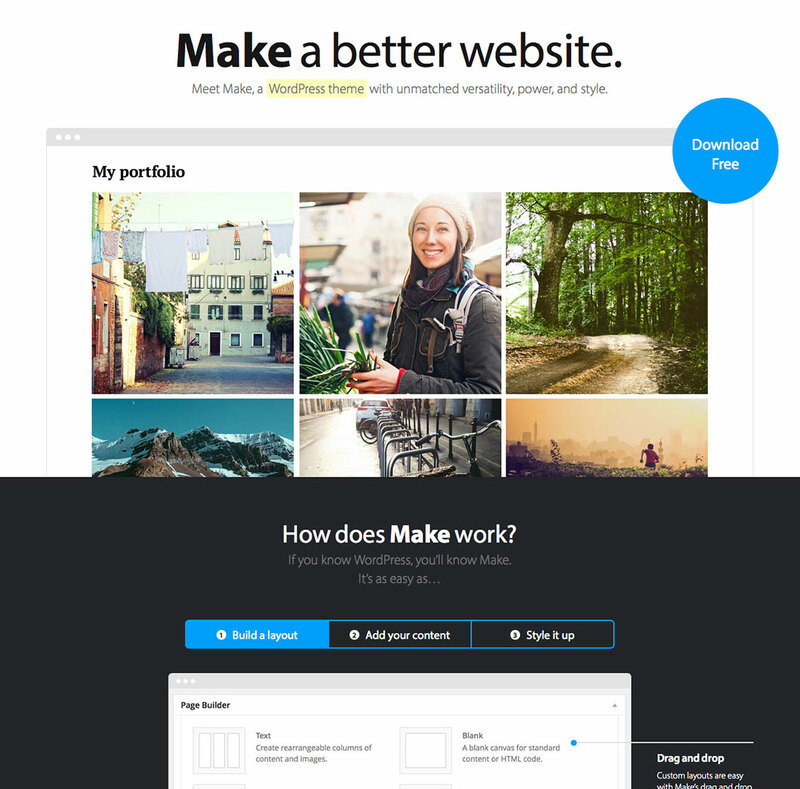 Make is completely free and hosted in the WordPress theme directory. It’s also fully compatible with popular plugins like WooCommerce, Gravity Forms, Contact Form 7, Jetpack, and WP PageNavi. View the source code and contribute over at the Make Github repository. Free, and our best yet. All of these websites were built with Make. None of them required any complex code changes. They all used the built in customization options and the flexible drag and drop page builder. Even more WooCommerce: a built in WooCommerce builder section and per-page WooCommerce options. Get started right away with quick start builder template designs that include demo images and content. Take your page further with builder widget support. Add widgets directly to any text section in any page. Use your own Typekit account and quickly add world-class fonts to your website. No two pages need look the same with per-page options. Set unique sidebars, headers, footers and toggle dates, authors, meta, and featured images. And more! See all the features on the Make theme page. If you bought Make Plus during our customer only presale event, sign into your account and click on the Downloads tab. You’ll now see Make Plus listed in your downloads. Install it like any other plugin and drop us a line in the Help Center if you have any problems. Please be sure to update Make to version 1.0.5 before using the plugin. Make is free, so we’d encourage you to download it and give it a try. We really hope you like it. Let us know what you think in the comments! I got Make Plus and I’m working implementing it on my personal site just to get a hang of it. I do have a question. Is there a particular reason that the layouts only apply to pages and not posts? Thanks for upgrading to Make Plus, we appreciate it. Good question. With the way WordPress works, using the same sort of builder for individual blog posts wouldn’t really work very well. What specifically are you trying to accomplish with the blog posts? Just more control over the styling over each individual blog posts? Or more control over the blog styling in general? I was hoping to publish better looking posts with the same or similar control as pages. If it does not work well or at all with posts, I’ll just make pages. Sounds good Artur. I think that’s your best bet. Hey, I’m really interested in your new theme, good job! Could I change the font to a Chinese one of the theme? Hi, just started using Make today and considering upgrading to Plus. This is a really great theme and looks like it’s what I’ve been looking for. One thing, however: I notice that my entire comments section disappeared. It doesn’t appear whether on Main page or on Post or on Page. Help please? Thanks. The comment issue is a bug and will be fixed in Make 1.1. We have submitted the theme to the WordPress.org repository and it should be available for update later this week. For now, after you add a post, you can enable comments for a post after publishing it. Again, you won’t have to do this as soon as you can update to the new version. Hello all, I have Make and upgraded to Plus! As the needs of the site have changed, so I get to make new and exciting changes to the site. The Question: In the top header bar for social media, I want to place my own Icons and customize the bar. I have found and followed your instructions and – in my sand box – have a nice f for Facebook and boxes with an arrow up and to the right. These are nice icons but not what I want. I dug around in the files looking for sprites and found no social media icons and presume they come from the sites on the list in the Customizer panel. How can I put my own Icons in the bar? Yes it is a custom menu called social_menu per your instructions. AND, I have an email that I want to show up there also. I have tried leaving the address out of the Customizer panel and only in the custom menu – not working and defaults to http://email address and I have reversed the process to no avail and left it in both places – nada, same http:// default, not good for email addresses. Thanks for upgrading to Make Plus, we appreciate it. Would you mind asking this in our Help Center? We can give you a much more efficient support over there. I’m building a website using make. I’m interested in to try Make Plus, but I want to be sure that it’s what I need. Is there any possibility to try it before paying the 99$? There isn’t a way to try it without purchasing, but you can test out the Customizer setting by visiting any of the Make demo sites. We’ve also got a 30 day return policy, so if it doesn’t work as expected, you can always return it. the social icon tab opens in same tab does there any way to open social links in another tab…! !